So, a little confession from your Roman Catholic Cop. I like Chinese food. That's not really a confession you may be thinking. But I like your junk Chinese food. Not the types from your nice, authentic Chinese restaurant (or, as they call them in China--restaurants) but the Chinese food from your fast food type of places, like Panda Express or those ones in the food court at the mall. YUMMY! I know it's sort of like saying you like Taco Bell compared to a nice Mexican Restaurant. The food isn't the same at all. But the one thing that is the same is the fortune cookie! I just happened to go to Panda Express on Monday and the fortune that I got really spoke to me. It was one of those you actually keep and stick on your bulletin board. It's says, "Look towards the future, but not so far as to miss today." "Look towards the future, but not so far as to miss today." That speaks volumes to me. I'm the type of person who is always looking ahead. In boot camp, every day was, "68 days (or how ever many days it was) and a wake up!" I'm the type of person who, at least mentally, marks the days off on the calendar. I'm looking ahead thinking, "One day the kids will be gone and my house will be clean!" I'm the type of person who gets all worried about something that MIGHT happen. I'll be on vacation and instead of enjoying myself I will be fretting about having to go back to work. Heck, I sometimes worry about what MAY happen instead of enjoying what IS happening. It's good, I think, to look towards the future. It helps us set goals. It helps us keep on task. tI defeats the every day boredom that comes about. It's good to visualize ourselves as having lost that ten pounds, graduated college or being healthy. If we just live in the now we loose those goals and aspirations and it can make the future much more difficult for us. By looking towards the future we become disciplined so that we can attain those goals and dreams. It's also good to look towards the past, but again, not to live there. It's important to look and see how we have done--whether good or bad. It's good to remember where we have come from so that we can see where we are and where we are going. It can be an encouragement. It can be a wake up call. It's good to see what types of sins we've committed in order that we don't commit them again. But we can't live there. That's just sad. It's sad to see someone who is still living in there "glory days" and their life stinks now. It's sad to focus on our pasts sins when we've already confessed them and been forgiven but we haven't forgiven ourselves. We are in the present and that is where we should focus most of our attention, even if we are in a bad situation. While sometimes there is nothing for us to do, it is in the present that we can fix things we have done in the past and prepare ourselves for the future. But we must always concentrate right now on being the best person we can possibly be right at this moment. Just as God is timeless, we have to kind of float between the past, the future and the present. But we must concentrate on the present. Don't worry about the past. Don't worry about the future. And CERTAINLY don't miss today. You'll miss things. You may miss the enjoyment of your friends and family because you are worried about what may happen. 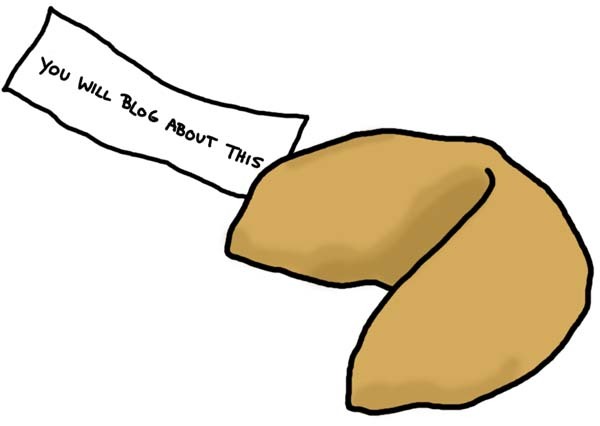 That's why the cookie was right, "Look towards the future, but not so far as to miss today."